A car bomb exploded along the main street of Somalia's capital Mogadishu on Sunday, killing at least five people and wounding several others, authorities said. Police said a car bomb parked in front of a restaurant at the busy street of Maka al Mukaram had exploded. The front of the restaurant had been destroyed, blood stained the floor and chairs had been strewn around by the blast. 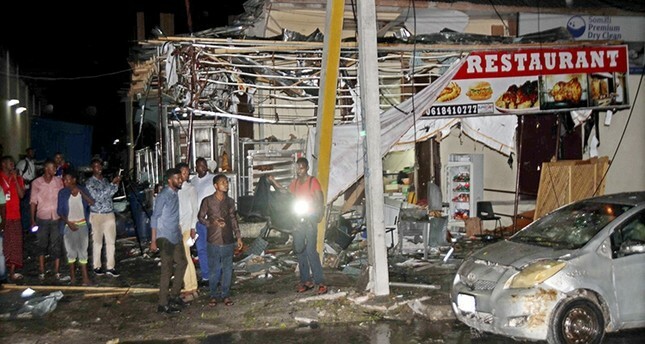 "A car bomb exploded at a parking in front (of) a restaurant," Major Abdullahi Hussein, a police officer, told Reuters. Militant group al-Shabaab claimed responsibility for the attack on a website sympathetic to their cause. It was the second fatal attack al-Shabaab claimed on Sunday, bringing the day's death toll to 17, excluding their own fighters. Earlier at least 12 people were killed in a suicide car bombing southwest of Mogadishu. The attack hit the Afgoye district, claiming the lives of seven civilians and five police offers, police officer Ali Hassan told dpa. At least 14 others were wounded. "The blast sent thick and dark smoke into the sky from the site of the explosion, a security checkpoint inside Afgoye," eyewitness Nuradiin Jama said. Afgoye is an agricultural town located 30 kilometers (18 miles) southwest of Mogadishu. In a separate incident, security forces killed two militants in Mogadishu's Hodan district. Al-Shabaab said the two militants were members of their group. Somalia has been convulsed by violence since 1991. Al-Shabaab is fighting to dislodge a Western-backed government protected by African Union-mandated peacekeepers.